The default code list in Cash Manager Focus includes specific settings attached to each livestock extended code, such as physical settings including weight related defaults. Whether you’re recording actual or planned livestock sales and purchases you can record the stock weight as being either Carcass or Live. The livestock extended code determines whether a live mode or carcass mode is applied to each sale/purchase event. For example, the default setting for a 1yr bull is Live, while for an MA ewe it is Carcass. The flexibility of your code list means that you can override this setting within each sale/purchase event. You can also permanently change the default mode in the livestock extended code itself. 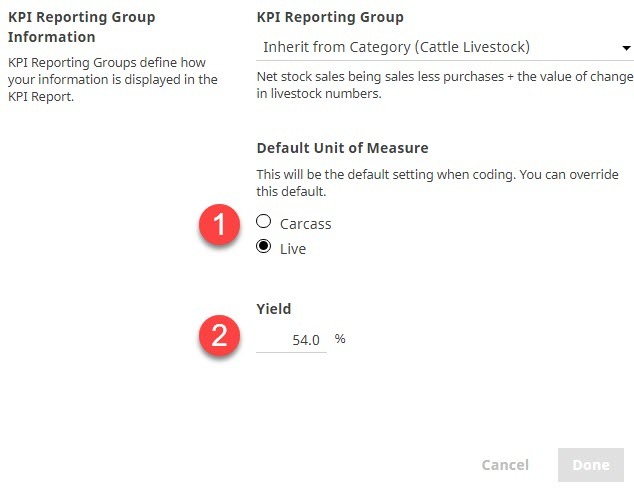 The percentage in the Yield field automatically calculates either total carcass or total live weight of livestock based on what you've recorded in sales and purchases. Information is instantly displayed when you're recording actual or planned events and will also eventually be available in reports.